I had always been fascinated by old, decaying buildings and what was contained within them – there is a certain romance to them, dreaming of what they were used for, what kind of people were in them, why they were abandoned – however, as a bit of a wimp I never dared venture into them. Who knew what lurked inside? Sylvain Margaine, on the other hand, is a seasoned urban explorer and has explored hundreds of abandoned buildings. 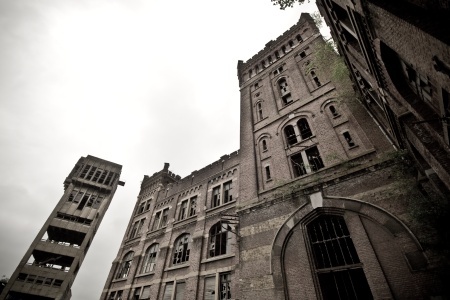 Urban exploration is the examination of the unseen or off-limits parts of urban areas or industrial facilities, such as factories, storm sewers, old hospitals, offices, or schools. Sylvain Margaine is a French engineer who lives in Brussels, and has been doing urban exploration since he was a child, along with his father. Since then, Sylvain has documented these buildings on his website, with hundreds still to come. 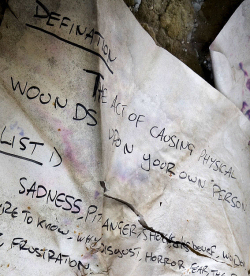 Below, Sylvain describes his five takeaways of urban exploration. 1. Sometimes abandoned structures have some strange guests. Sylvain recommends shouting a big hello when first walking into an abandoned building, so as to not startle the person, or yourself, if there are some unexpected guests. 2. To go urban exploring, it’s best to bring at least some gloves, rubber boots, a lamp and some spares, and a multitool. Sylvain changes the list of items to bring with him depending on the conditions of the building. However, there is a standard set of items he brings with him every time. Sylvain suggests a couple extra things. Sylvain suggests that other people he’s met like to bring other things, like a Maglite or tools – however, he much prefers to store extra things in his trunk and come back out to get them. 3. It’s also a wise idea to bring a friend. Sylvain also suggests bringing a friend or two, or going in a group, particularly when going into unfamiliar territory. For example, when going to a local veterinary hospital in Brussels that had been closed for almost 20 years, Sylvain had to enter through a hole in the ground, and then fell into a deep and dank basement. When he turned his headlamp, he was surrounded by preserved animals and dozens and dozens of rats. “It was like a horror movie,” he shudders. It is times like that when a friend can come in handy as support or to get help. 4. Old buildings are like a puzzle. Most of the time however, urban exploration is not as frightening as it may seem, and it’s the intellectual challenge that loops Sylvain in. “First, you have to identify access points to get into the building, and when you are in the building, you have to find the hatch that will give you roof access – you end up learning intimately about architecture from different centuries. For example, it can take hours to get from Point A to Point B even though its very close – sometimes you have to go through a ventilation shaft to get to the other side of a wall,” he explains. As an engineer, Sylvain is always up for a good puzzle. 5. To stay out of trouble in urban exploration, it’s best to look like you’re not causing trouble (and actually not cause trouble). I ask Sylvain if he’s ever gotten into trouble while urban exploring. “Nothing serious – I’ve never been arrested, but at times it’s been very close. I’ve been stopped by security many times. However, because they see me with cameras, not smashing, stealing or spray painting – only documenting – they recognize that and are accepting,” Sylvain says. “It also helps that I have prepared a speech to explain what I do – and it tends to turn out good,” he laughs. More about Sylvain’s urban exploration can be found at http://www.forbidden-places.net/ and his book can be found at http://www.forbidden–places.net/book.php.